It was a night of irresistibly danceable rhythms, social commentary, bare feet, and a lot of joy as the "Summer of FUV" concert series concluded on September 15 with one last FUV Live broadcast from Forest Hills Stadium. 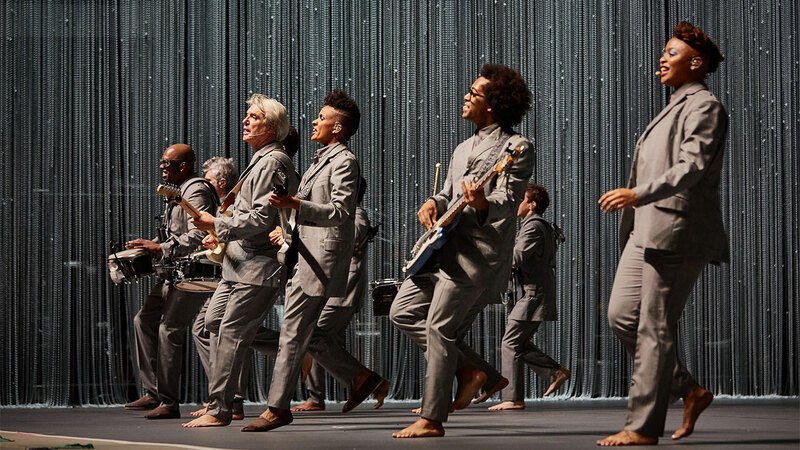 On this perfect, late summer evening — which you can relive below — David Byrne returned to the historic grounds in Queens, for the first time since new wave pioneers Talking Heads performed there in 1983. As co-host Rita Houston and I greeted fans in the WFUV Clubhouse, we met many folks who were excited to be back in the audience again after 35 years. Since Talking Heads split up in the early '90s, Byrne has never stopped following his creative muse, and it has taken him in many exciting directions: theater, solo albums, collaborations, book writing, founding a record label, and film scores and soundtracks. There's even been a live color guard performance piece, Contemporary Color, featuring ten color guard teams performing to original music by ten contemporary artists of Byrne’s choosing. One of those artists was Tune-Yards' Merrill Garbus, who also opened tonight's concert (listen to her set in the Vault). 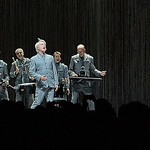 The Remain In Light tour, which was not only on this very stage three decades ago, but also the basis for the Jonathan Demme 1984 concert film "Stop Making Sense," echoed throughout Byrne's performance on this warm evening. Paralleling his entrance in "Stop Making Sense," where he came out to a bare stage with a boombox and acoustic guitar, tonight the lights rose on Byrne, again alone on stage. 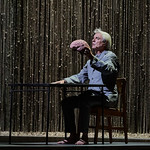 Only this time he sat at a table, holding a plastic model of a brain, and sang the opener, “Here," which is the final song on his new album, American Utopia. 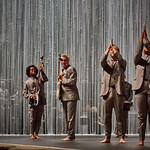 This time barefoot (no white sneakers) and wearing a grey suit which was far more tailored than his signature “big suit” of "Stop Making Sense," Byrne didn’t remain on stage alone for long. Through a silver-beaded curtain that completely bordered an otherwise empty stage, Byrne led a 12-piece, identically grey-suited (and barefoot) band through an 18-song set with a three-song encore. Every band member moved nonstop in choreographed formations, wearing wireless headsets and carrying wireless instruments. The effect was breathtaking in its minimalism, making use of dramatic lighting and choreography to brilliant visual effect. 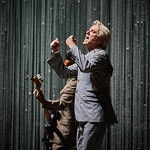 While two-thirds of the set featured new material off of American Utopia, it was seamlessly interwoven with music taken from Byrne’s long career. The crowd absolutely exploded with delight at the first Talking Heads song of the evening. Three songs in, “I Zimbra” led straight into “Slippery People," which was the first musical nod to "Stop Making Sense." The set also highlighted many of the collaborations that have dotted Byrne’s catalog, including “Lazy," which he wrote with the British dance duo X-Press 2, and “I Should Watch TV” off Love This Giant, Byrne's project with St. Vincent. He also included two songs he wrote with Fatboy Slim's Norman Cook: the Brighton Port Authority and Dizzee Rascal-collaboration “Toe Jam” and “Dancing Together” from Cook and Byrne's Imelda Marcos-inspired musical, Here Lies Love. His civic-minded reminder wasn’t the only political statement of the night. His new song “Bullet” ruminates on gun violence, and his powerful set-closer was a cover of Janelle Monáe's “Hell You Talmbout," a powerful protest song that repeats the mantra of “Say his name, say his name, say his name” and names African-Americans who have been killed in encounters with law enforcement or due to racial violence. Byrne was incredibly lithe and youthful both in his movements and in voice, and the band was jubilant and in perfect step with each other. 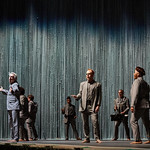 The music was absolutely flawless — especially impressive given all of the simultaneous and continuous choreography. Byrne would even let out an enthused “Woo!” after every song, joining the audience in their loud, excited shouts and applause. There are few artists who can continue to make inspiring and relevant music and deliver such groundbreaking performances some 40 years into their careers. There are even fewer who could make a return to the historic Forest Hills stage into a fresh and modern experience, and not a nostalgia trip. 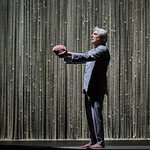 David Byrne did both on Saturday night and once again proved that his well of creativity never runs dry — he's remained engaged and excited about new ideas and the timeless expanse of possibility.